A steam cloud emerging from an upper flank vent . . . was seen from neighboring Amchitka Island on 1 June at about 1000. Ash began mixing with the steam after ~30 minutes, and steam and ash emission remained visible until weather conditions obscured the volcano 3 hours later. At about 1500, a Reeve Aleutian Airways pilot reported a steam plume rising to ~3.5 km altitude, associated with a dispersed gray haze at about the same altitude. Authorities issued a NOTAM. When a U.S. 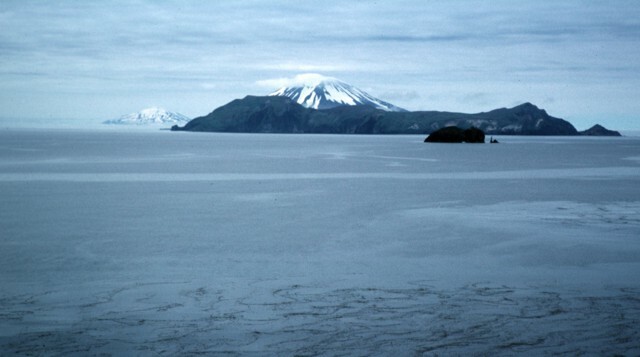 Fish and Wildlife Service (FWS) vessel traveled past the N and W sides of Kiska Island on 3 June, no ash was visible on flank snow cover, although some light snow might have fallen since the eruption. Steaming from the W vent appeared typical. A plume from Kiska was clearly evident on radar aboard the Soviet vessel RV Vulkanolog, as it passed ~200 km N of Kiska on 4 June at 0800. However, no ashfall was noted at the ship. Information Contacts: AVO; Nikolai Seliverstov (chief of expedition, RVVulkanolog), IV; Eugene Yogodzinski (RVVulkanolog), Cornell Univ; Anchorage Times, AK. The Global Volcanism Program has no Weekly Reports available for Kiska. "Last night the people on Amchitka visually sighted a volcano erupting about 50 miles NW of the island. It was on one of the smaller islands which they could not identify. They observed volcanic ash to approximately 1,200 feet and steam to about 12,000 feet. They visually sighted flames and lava last night at approximately 1000 GMT on 12 September. The eruption was observed at periods of about two minutes during the most active period of the volcanic activity." Positive identification of the erupting volcano has not yet been made. The following was received via cable from D.B. Stone on 15 September. "Kiska volcano seen to be active. Much steam, strong sulfur smell, air temperature as recorded by aircraft 10°C higher over N tip of island than over adjacent sea. Unable to see other islands due to poor weather. Kiska likely source of events seen from Amchitka." The following report is from a telephone conversation with L. Kerry on 16 September, 7:00 p.m. EDT. "The first report we had was the 12th of September from the people working on Amchitka Island, who called in and reported that there was steam and that it seemed to be throwing something up into the air. This wasn't happening on the afternoon of the 13th when our military plane flew over. These first reports were just visual reports from Amchitka and because of overcast skies, they could only see it occasionally in snatches. There were no explosions heard, or none were reported to us, and they didn't say if there was any eruption cloud. The plane definitely pinpointed the volcano on 'Little Kiska' island. They measured a definite rise in temperature from as close as they could get in the plane of 15°C; there was steam and there seemed to be evidence of a small lava flow. The latest report we have from witnesses on Amchitka seems to indicate that it is beginning to stop; and a pilot reported the volcano is down to just steam a day ago." Card 0751 (12 September 1969) John B. Townshend, College Observatory, Coast and Geodetic Survey, College AK, USA. Card 0752 (17 September 1969) D.B. Stone, Geophysical Institute, University of Alaska, College, AK; Leonard Kerry, Adak Observatory, FPO Seattle, WA. From a 15 April NOAA 9 satellite image (at 1704), Steven Shivers (USGS) noted a narrow plume drifting ~60 km E from the volcano. No reports of an eruption have been received from airplane pilots or ground observers. Conical Kiska volcano is the westernmost historically active volcano of the 2500-km-long Aleutian arc. 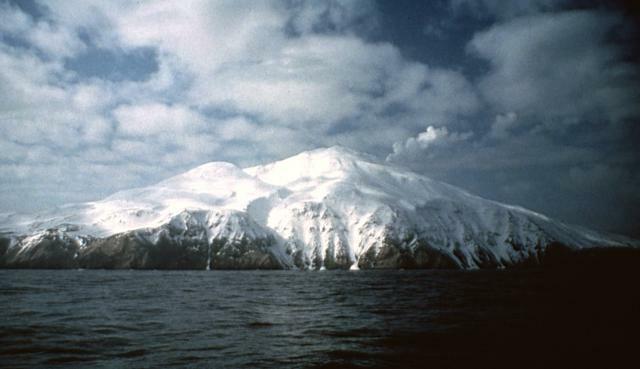 The volcano lies at the northern tip of the elongated Kiska Island, across a low isthmus containing East Kiska and West Kiska lakes. A 400-m-wide elliptical crater, breached to the north, caps the 1220-m-high stratovolcano. The volcano is surrounded on three sides by sea cliffs up to 450 m high and overlies an older volcanic center exposed to the south. A massive submarine debris-avalanche deposit extends 40 km to the NNW. The southern part of the NE-SW-trending island, the westernmost of the Rat Island group, has been glaciated, but all lava flows post-date the last major glaciation. Young, steep-sided blocky lava flows, primarily on the N and SW flanks, have originated from vents at locations ranging from the summit to near sea level. A flank cinder cone and associated lava flows were erupted in 1962 at Sirius Point on the northern coast. The island contains one of the best harbors in the Aleutian Islands, but is uninhabited. Coats R R, Nelson W H, Lewis R Q, Powers H A, 1961. Geologic reconnaissance of Kiska Island, Aleutian Islands, Alaska. U S Geol Surv Bull, 1028-R: 563-581. Remarks: Alternating uplift and subsidence is presumably caused by pore fluid pressure changes within a confined hydrothermal reservoir. 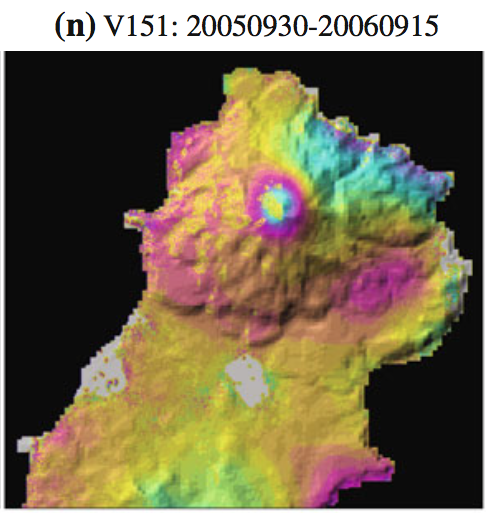 Observed C-band interferogram showing time-varying deformation near the summit of Kiska Volcano. A full cycle of colors (i.e., one interferometric fringe) represents 2.83 cm of surface displacement along the LOS. A color progression from red to yellow to blue represents an increase in LOS distance as a result of surface subsidence; the opposite progression represents LOS shortening (surface uplift). Areas lacking interferometric coherence are uncolored. 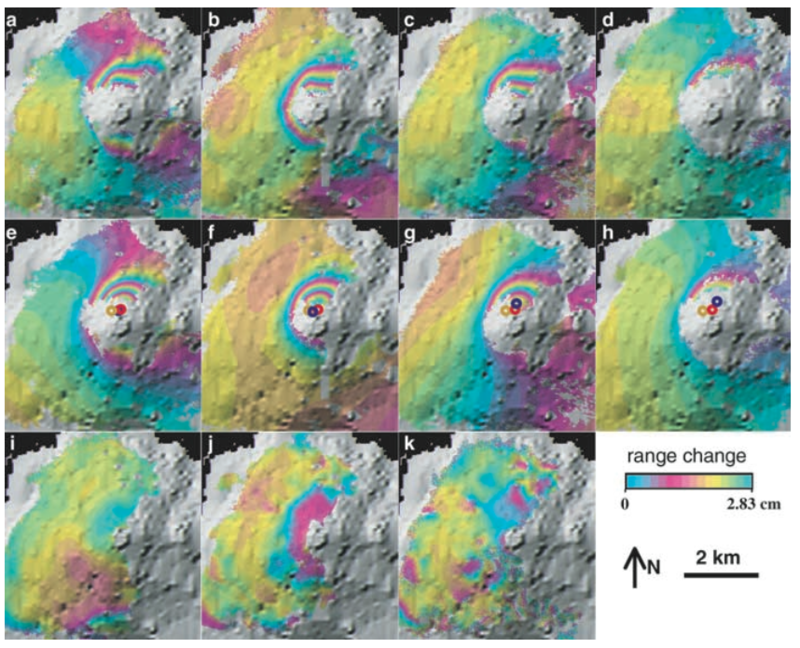 Interferometric phase images are shown superimposed on the shaded-relief image. 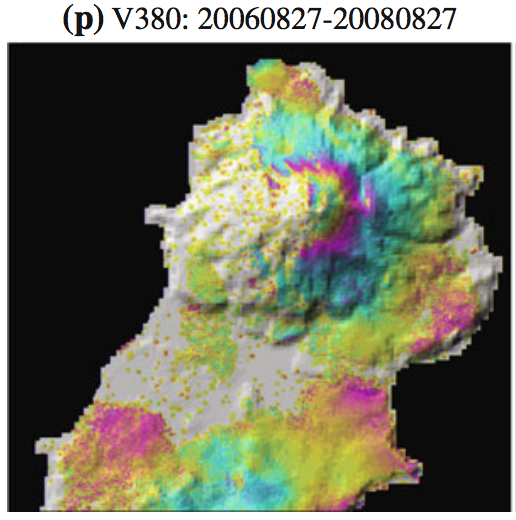 Observed and modeled interferograms that show time-varying subsidence near the summit of Kiska volcano from 1995 to 2001. The areal extent of the interferograms is shown in Figure 1. The interferograms cover the following time periods: (a) observed and (e) modeled interferograms spanning Oct. 1, 1995 to Sept. 25, 2000 (ha = 539 m); (b) observed and (f) modeled interferograms spanning Oct. 10, 1998 to Oct. 14, 2000 (ha = 441 m); (c) observed and (g) modeled interferograms spanning Aug. 2, 1999 to Aug. 21, 2000 (ha = 486 m); (d) observed and (h) modeled interferograms spanning Jun. 28, 1999 to Sept. 25, 2000 (ha = 1879 m); (i) observed interferogram spanning Oct. 4, 2000 to Jul. 21, 2001 (ha = 172 m); (j) observed interferogram spanning Oct. 4, 2000 to Aug. 25, 2001 (ha = 122 m); and (k) observed interferogram spanning Aug. 21, 2000 to Sept. 25, 2000 (ha = 58 m), which was used to verify overall accuracy of the DEM. The orange circle represents a vigorous steam vent reported by Jones et al. . Blue circles represent surface projections of locations for source models that best fit individual interferograms (Table 1). The red circle is the fixed source location based on the average of locations of individually best-fit models. The modeled interferograms are calculated based on the fixed source location. A full cycle of colors (i.e., one interferometric fringe) represents 2.83 cm of surface displacement along the LOS. Areas without interferometric coherence are uncolored. Interferometric phase images are shown superimposed on the shaded-relief image. From: Lu et al. 2002b. Reference List: Lu and Dzurisin 2014; Lu et al. 2002b. There is no Emissions History data available for Kiska. A steam plume rises from the summit of conical Kiska volcano, the westernmost historically active volcano of the 2500-km-long Aleutian arc. Three sides of the volcano, including the northern side seen here, are bounded by steep cliffs up to 450 m high. An elliptical crater, breached to the north, caps the stratovolcano, which occupies the northern tip of the elongated island. A flank cinder cone formed in 1962 at the northern coast. Photo by E.V. Kleff, 1985 (U.S. Fish & Wildlife Service, courtesy of Alaska Volcano Observatory). The following 27 samples associated with this volcano can be found in the Smithsonian's NMNH Department of Mineral Sciences collections, and may be availble for research (contact the Rock and Ore Collections Manager). Catalog number links will open a window with more information. Large Eruptions of Kiska Information about large Quaternary eruptions (VEI >= 4) is cataloged in the Large Magnitude Explosive Volcanic Eruptions (LaMEVE) database of the Volcano Global Risk Identification and Analysis Project (VOGRIPA).